Warrior I and II are great poses that work many muscles, while also challenging your balance. 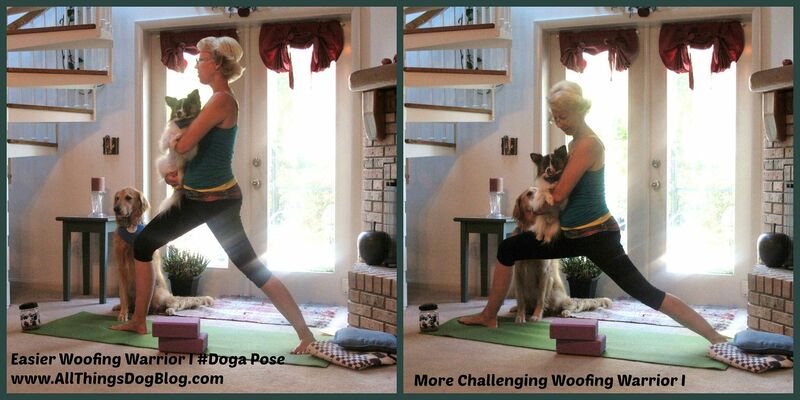 As you get comfortable with the balance, adding your toy-sized dog to your front leg increases the challenge, helping you get more out of your workout, all while you enjoy a nice cuddle. Making sure your back foot is turned out, also put emphasis on practicing balancing your weight between the front and back feet. Mastering this will aid in eventually getting your pose a bit closer to the ground. You'll find more Warrior yoga tips here. Lift up through your chest and head, keeping your shoulders down and aligned with your hips. joining in whatever you are doing. You can call Fido to you and talk to him encouragingly. By keeping the #doga in your yoga workout, you'll find it less stressful and feel a bit closer to your pup at the same time. That's our goal!